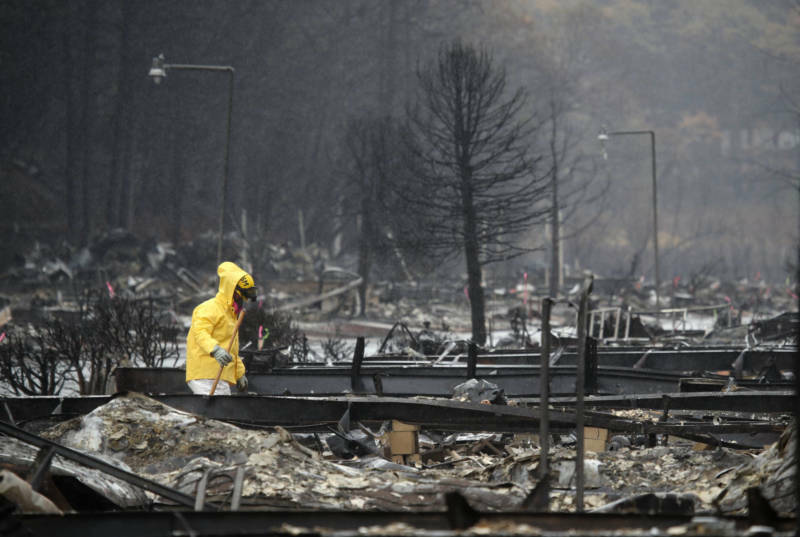 The first step of the cleanup effort for the Camp Fire, the deadliest wildfire in modern state history, will start on Monday with removal of hazardous wastes. The U.S. Environmental Protection Agency (EPA) is leading the interagency effort with assistance from the California Department of Toxic Substances Control (DTSC). The fire that ripped through Paradise left behind toxic household substances like paint, batteries, cleaners and pesticides. It's the sort of thing that EPA Incident Commander Steve Calanog said needs to be removed in advance of the CalRecycle team's arrival, which will begin to remove larger, nonhazardous debris early next year. "We need to do this in advance for the safety of debris contractors and homeowners," Calanog said. The team will be looking for things like batteries, which have lead, and asbestos from collapsed buildings. Calanog said the EPA is working closely with the town of Paradise and Butte County and it's estimated the first phase will cost tens of millions of dollars. The cleanup comes at no cost to property owners and is fully funded by Federal Emergency Management Agency (FEMA) and the state, Calanog said. The work will begin in the Lower Pentz neighborhoods in Paradise, where residents have gone in and collected personal belongings. CalRecycle is expected to come in after the EPA crews and remove larger debris until June 2019. While not involved in the later phase, he said previous criticisms of North Bay wildfire cleanup efforts by the Army Corps of Engineers is a major topic of discussion among recovery agencies in Butte County. The overall cleanup of last year's firestorm cost $1.3 billion. As reported by KQED, there were several safety and property damage issues connected to the project. "[The North Bay fire] was a little different because the Army Corps of Engineers was asked to do a lot of things not typical of their debris removal program," Calanog said. "Ensuring that experience does not happen again is [important] in the multiagency discussion." Calanog said overall debris removal will culminate with soil sampling and a larger assessment for property owners. On Tuesday, Dec. 4, Butte County and Paradise are partnering with other local, state and federal agencies to host a community meeting for fire survivors to provide an update on recovery efforts and discuss available resources.